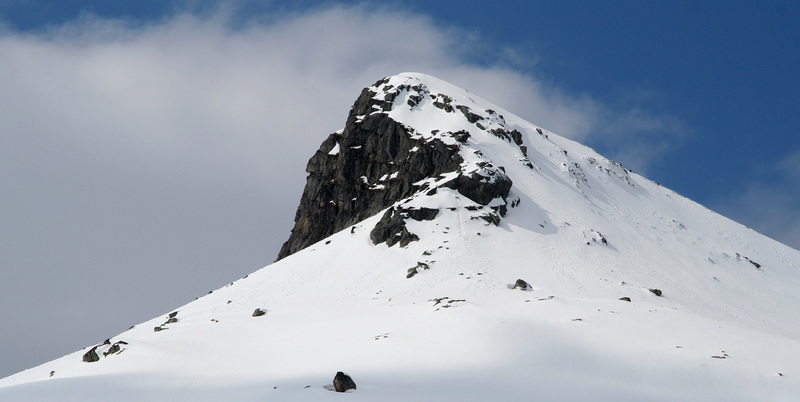 How to get there: This mountain is south of Fjærlandsfjorden and north-west of the small village Leikanger in Sogn. 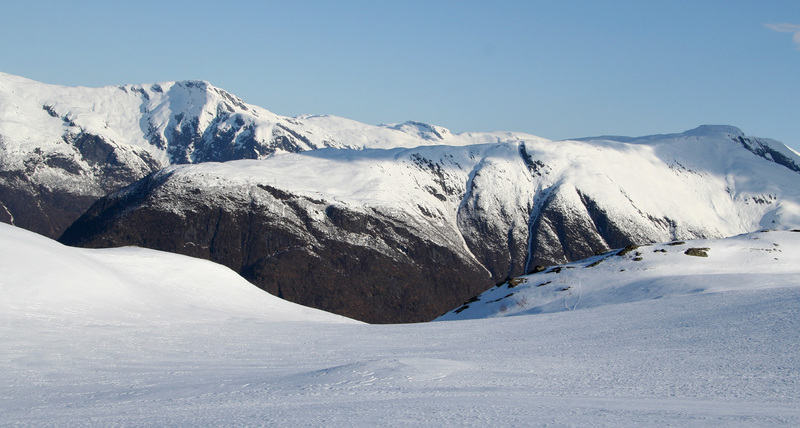 The easiest approach is through Grindsdalen that cuts north a few kilometer west of Leikanger. However, this mountain can also be climbed as part of a long traverse from the ferry at Hella to the village of Fjærland, along the south-east side of the fjord. From Bergen, the normal route would be via Voss, then across Vikafjellet to Vangsnes with ferry connection directly to Hella. Route description: This description starts at Hella and is part of the route called Sogndalseggi. Head up the paved road from the ferry at Hella and traverse right just above a house to locate the trail that heads uphill, initially passing a water tank. This trail is easy to follow, well built from use in older days. Higher up, you pass the farm Rud (white buildings) then continue uphill to Skarde at 513m and further to Rudstølen at about 730 meter. 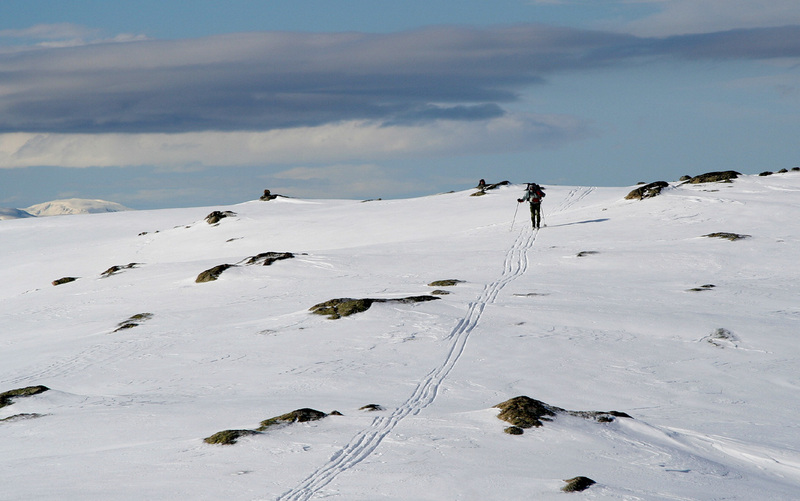 Follow the ridge as it climbs on Storholtfjellet and to the cairn Storholten (1024m) at a small but distinct top. Continue along the ridge to the base of Troeggi (1017m, N61:14.715 E006:39.194), then nicely up and along the broad ridge to the SW summit of Stav (1456m). Head east and contour down into the saddle between the two summits, then climb the gentle hill to the NE summit of Stav (1458m). Continue north-east from the summit and descend the ridge. 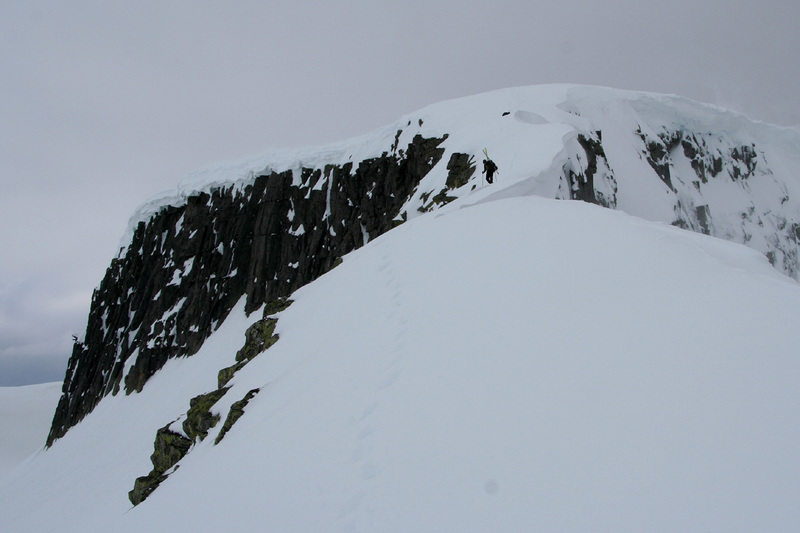 This ridge gets more narrow further down and is best traversed on foot for a short section. Slight exposure, but an easy and fairly wide ridge. 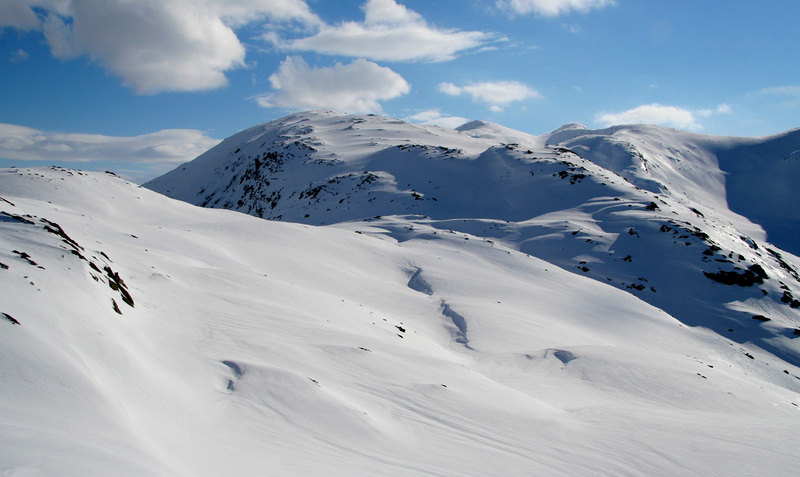 Descend further east, then contour north and into the nice bowl east of Stavafjellet. Descend to the valley floor near Stavatjørni (978m). The route continues up the broad and gentle ridge to Skarholten (1543m). Unfortunately, the weather forced us to turn around here. Hopefully, this route can be continued later. 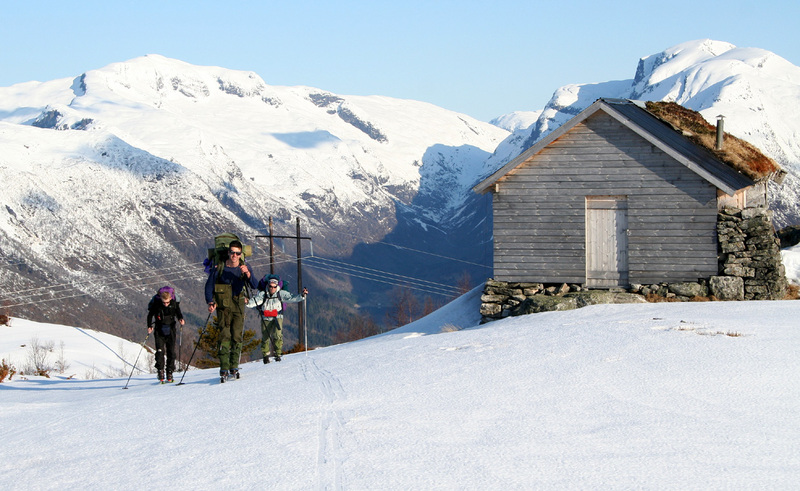 From Stavatjørni (978m), one may follow the valley Grindsdalen south passing the mountain farm cabin Stavsete (770m) then connecting with a road further down. Comments / Trip Report: This trip was organized by the Bergen Mountaineering club (DNT Fjellsport Bergen), the plan was to complete a ski traverse of the high ridge starting from Hella and ending in Fjærland. The route had been researched by the trip organizer, Leif Rune Løland. His plan called for a tough trip with approximately 4700 vertical meter along the route. The 3 day weekend forecast just improved as Friday arrived and promised stable, good weather for the entire period. 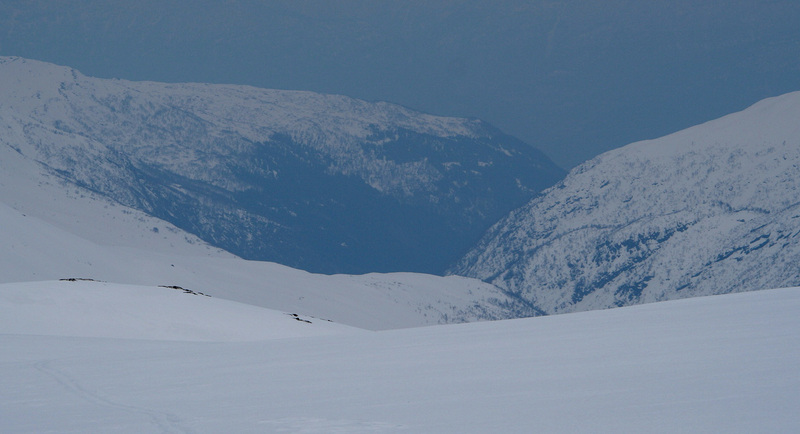 Everything therefore looked very promising indeed for a spring ski trip in rough and wild mountains. We left Bergen around 1630, our first task was to pick up a guy in Åsane. Big time weekend rush traffic, and the guy canceled just as we made it to the agreed meeting place. We made the ferry from Vangsnes at 2000, and started hiking from Hella around 2030. A nice trail headed up the hillside, the Rud farm with big white buildings, old apple trees and no road about 250 meter above the fjord - fabulous views, but the manual labor required to establish a farm up here is beyond imagination. As we climbed higher, suddenly there were voices and music, the surprise of the evening. A local school had established camp with big tents, a fire, guitar music and generally good spirit. 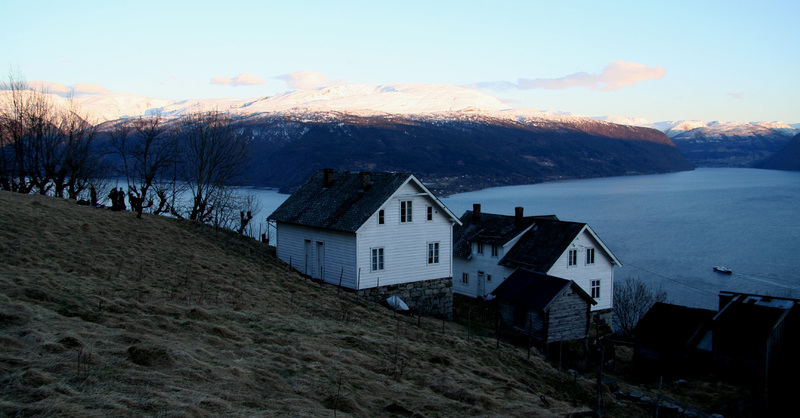 We continued to Skarde, with old buildings and a nice place to camp just before hitting the snow. Skarde is at 515 meter elevation. The next morning we started out at 0730 and quickly got on skis. The skiing up along the ridge was very nice and the first Stav summit was reached at 1100. We crossed over to the highest summit and then descended the (east) ridge down to Stavtjørni (978m) where we had lunch. However, one team member was clearly too tired to continue. It was decided that Leif Rune should follow him down to Stavsete (770m), from where he could safely descend on his own. The remaining party of 4 should head up across Skarholten. We had agreed to camp east of Frudalsvatnet that night. However, just as we approached Skarholten (we were at elevation 1453m), half the party felt that the wind was uncomfortably strong. I felt perfectly happy to continue, but two members felt we should descend back down the hill. Too bad, after gaining all this vertical. I was convinced that this decision would significantly change the entire trip. We descended and met up with Leif Rune. He was certainly confused seeing his team heading in the (wrong) direction. Well, not much could be done, but setting camp right there and then consider the situation the next day. We had strong gusts of wind throughout the night, but I still slept pretty well. The next morning, we considered a shorter trip, crossing Skarholten, then heading south across Kaldekletten, but more bad news came across from the other tent. One team member had an eye infection (similar to snow blindness), it had been painful and kept him awake most of the night. He clearly should descend immediately. As the wind continued with gusts at storm level (exceeding 20 m/s), we all decided to abort the trip and return down Grindsdalen. This route is nice and easy and we all reached the road between Leikanger and Hella at 10:55. At Hella, just off the ferry. The route starts out up the curved road behind. The (roadless!) farm Rud, with evening view across to Rambera (1623m). Fresvikbreen is further behind. 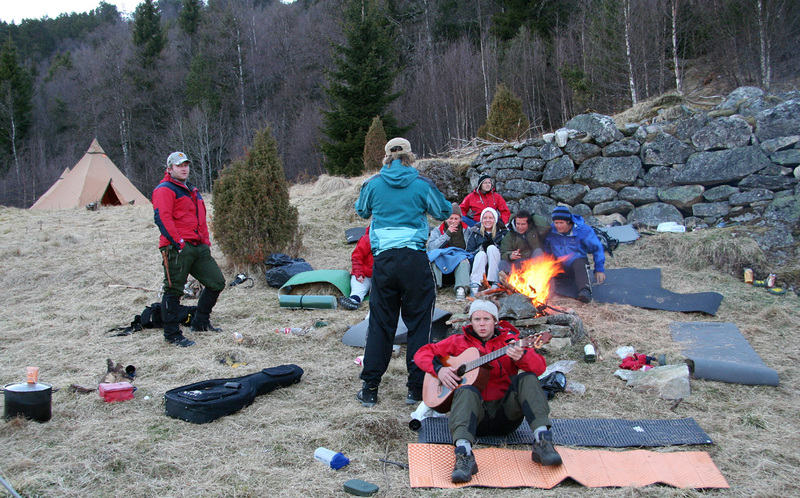 Party up in the hill, a local school had a weekend camp about 300 meter above the fjord. 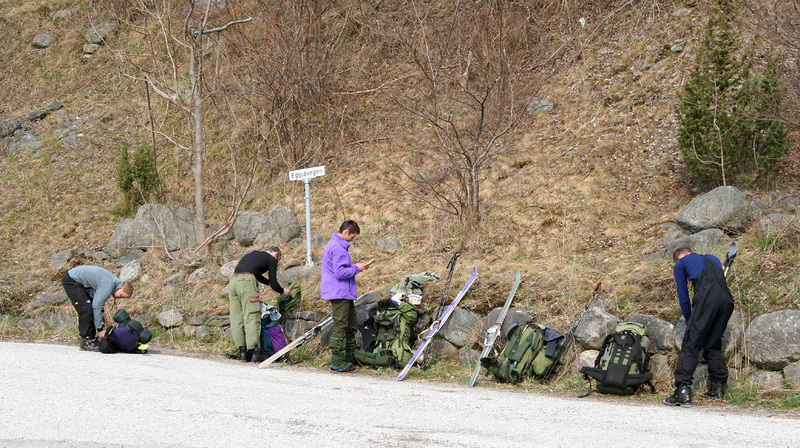 The team arriving at Rudstølen. 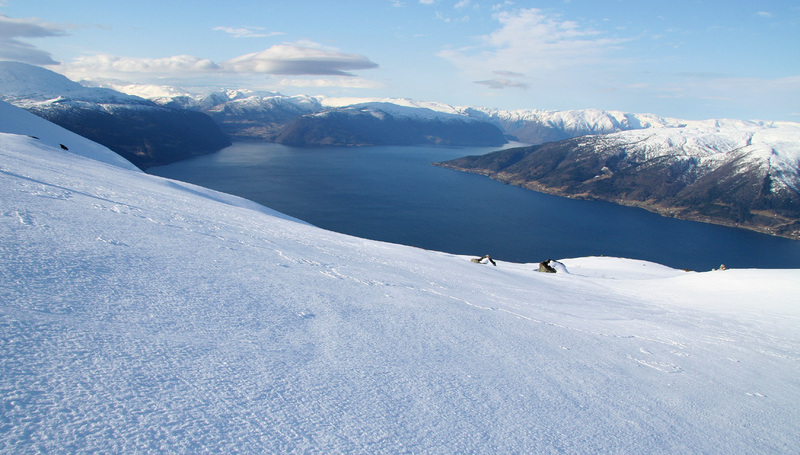 Skiing on Storholten, Sognefjorden behind. Meneseggi, the first segment of another nice ski route. Meneseggi, in the foreground, as seen from Storholten. Troeggi, the route towards Stav. Traverse of Stav, descending the east ridge. A narrow section is best negotiated on foot. Stavafjellet, north peak (1290 m). 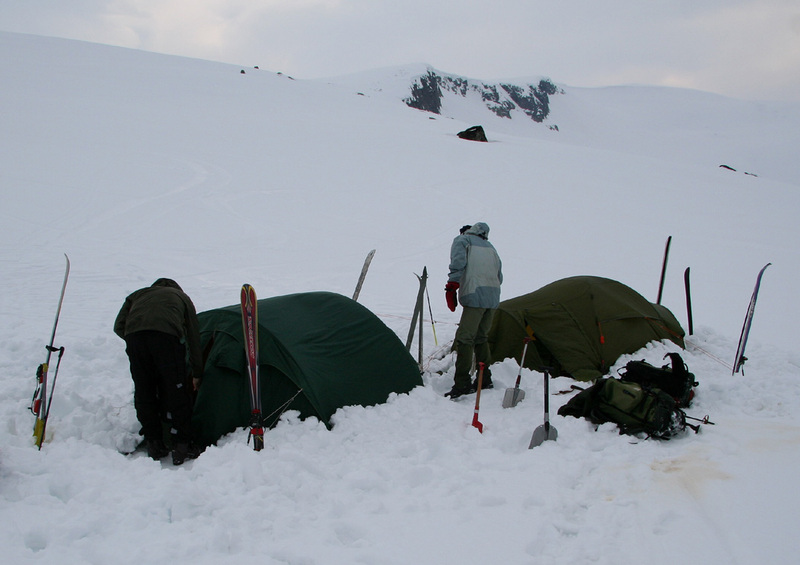 Camp, the Skarholten ridge behind (elevation 1262 m). Stav, as seen from our camp, the ridge we decended is visible to the left. Grindsdalen, the view is south. The team is back down.